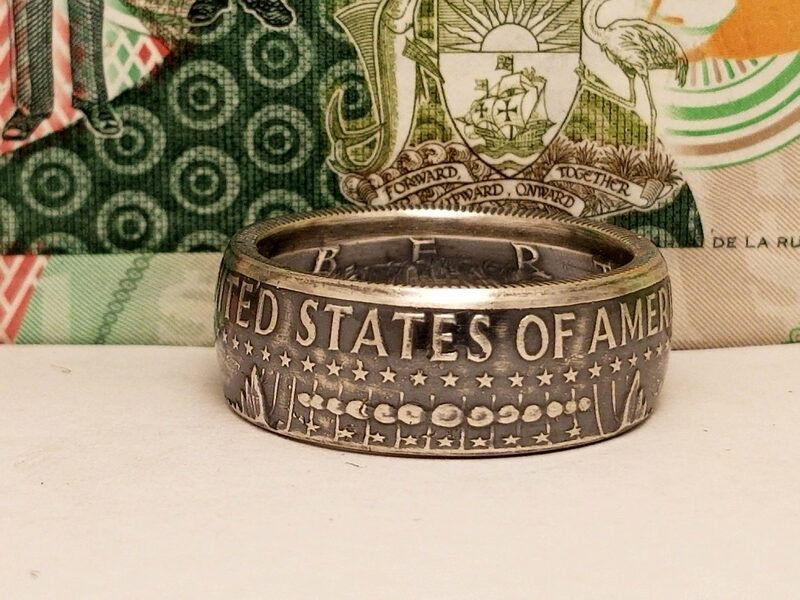 These coin rings are made from 90% silver 1964 JFK half dollars. 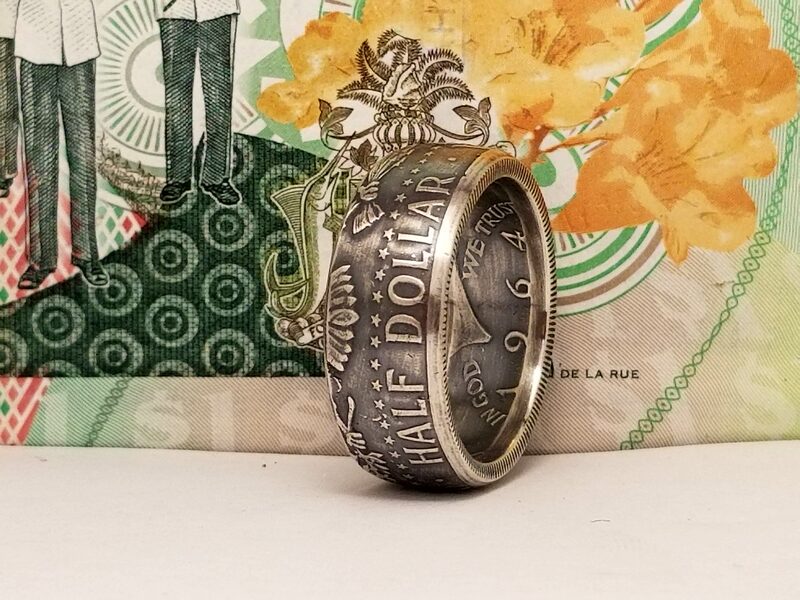 This listing is made with the tails side of the coin facing out on the ring. This was the last year that the US made 90% silver. These tails side out JFK halves make particularly nice looking rings. They can be made in US size 4-14 including half sizes. The JFK half dollar, first minted in 1964, is a fifty-cent coin currently issued by the United States Mint. Intended as a memorial to the assassinated President John F. Kennedy, it was authorized by Congress just over a month after his death. 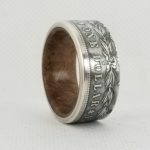 Use of existing works by Mint sculptors Gilroy Roberts and Frank Gasparro allowed dies to be prepared quickly, and striking of the new coins began in January 1964. The silver coins vanished from circulation upon their release in March 1964 due to collectors, hoarders, and those interested in a memento of the late president. Although the Mint greatly increased production, the denomination was seldom seen in circulation. 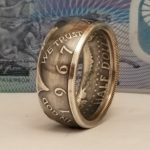 Continued rises in the price of silver increased the hoarding—many early JFK half dollars have been melted for their silver. The Treasury Department made the coins available to the public beginning on March 24, 1964. A line a block long formed at the department’s windows in Washington to purchase the 70,000 coins initially allocated for public sale. Although the department limited sales to 40 per customer, by the end of the day, the coins were gone, but the line had not shortened. Banks in Boston and Philadelphia quickly rationed supplies, but still sold out by noon. 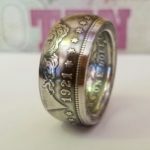 Sales in New York did not begin until the following day, and rationing was imposed there as well, to the disgruntlement of the head of the coin department at Gimbels, the largest dealer in the city, which had hoped to sell the coins at a premium. The coins were popular overseas as well. U.S. Assistant Secretary of State for African Affairs G. Mennen Williams distributed plastic-encased specimens to presidents and foreign ministers of African nations and to the U.S. ambassadors serving there “to win friends for the United States in Africa”. Shortly after the coin’s release, the Denver Mint began receiving complaints that the new coin depicted a hammer and sickle on the bottom of Kennedy’s truncated bust. In response, Roberts stated that the portion of the design in question was actually his monogram, a stylized “GR”. The Mint struck JFK half dollars in large numbers in an attempt to meet the overwhelming demand. 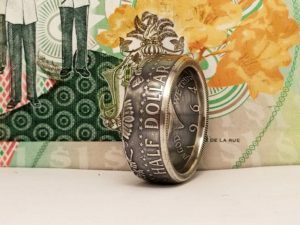 The Treasury had initially planned to issue 91 million half dollars for 1964, but raised the number to 141 million. However, a public announcement of the increase failed to cause more coins to actually circulate or to decrease the prices on the secondary market. By late November, the Mint had coined approximately 160 million pieces, yet the coin was almost never seen in circulation. Silver prices were rising, and many coins were being hoarded. Hopeful that issuing more 1964-dated coins would counter the speculation in them, the Treasury requested and received Congressional authorization to continue striking 1964-dated coins into 1965. 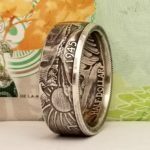 Eventually, almost 430 million half dollars dated 1964 were struck, a sum greater than the total struck for circulation in the sixteen years of the Franklin half dollar series. Could not be any happier with how the ring turned out. The fit was perfect and the ring is in outstanding condition. Extremely fast shipping and great craftsmanship. Thank you for providing such a good service at a fair price.